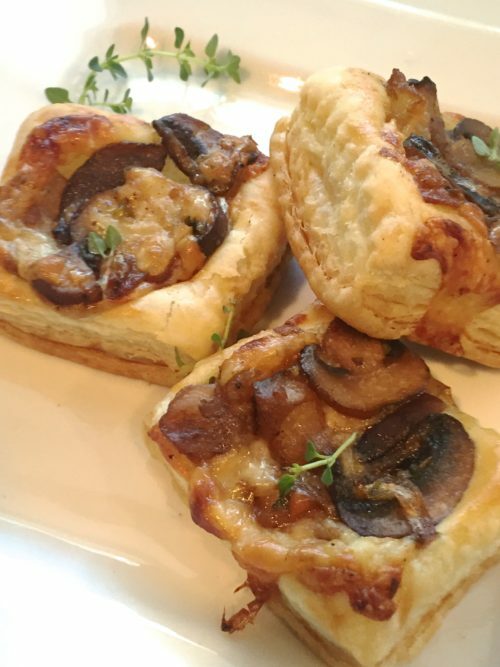 Little bites of puffed pastry and mushrooms. With the holidays right around the corner this little appetizer will be a favorite of your guest. Appetizers have always been one of my favorite things to make and when I catered most of the parties I did over the holidays were all appetizers. I would always have extras and they would be in my freezer at Christmas time and I could pull out so many different favorites for my family and it saved me a lot of time in the kitchen. These days, since I’m not catering anymore, I have decide on some of my favorites to make or come up with something new to surprise my kids. I have a few special ones picked out already for Thanksgiving. Sometimes when it comes to puffed pastry, I can take it or leave it. I’ve used it a lot over the years and I think I like it best when it is topped with something and baked. 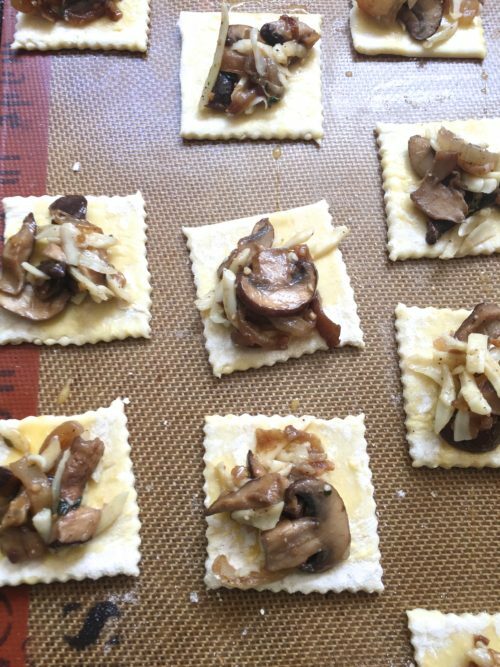 These little mushroom bites can be done ahead; do the onion/mushroom mixture a couple of days in advance and then you can top your puffed pastry squares with the mixture and bake when ready to serve. BLAST FROM THE PAST: I’ve been making Parmesan Bacon Wraps for almost 30 years. In last month’s issue of Southern Living, they printed a recipe for them but without the parmesan cheese. So if you saw that recipe, for sure add on some parmesan cheese to the cracker before wrapping in bacon. 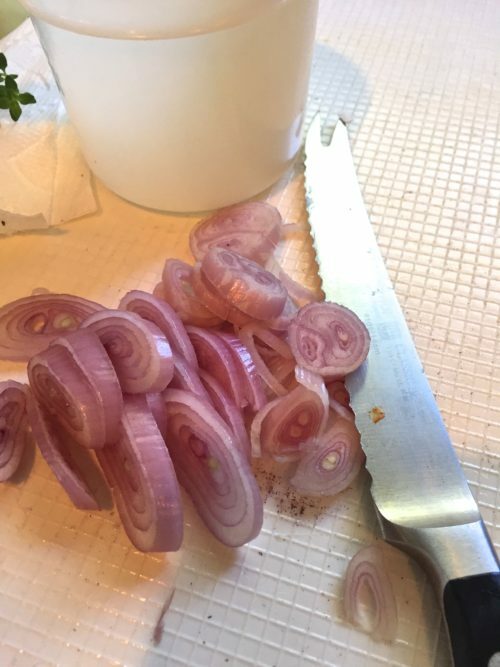 Use all white onions if you want, I had these shallots I wanted to use up so I included them as part of the onion. 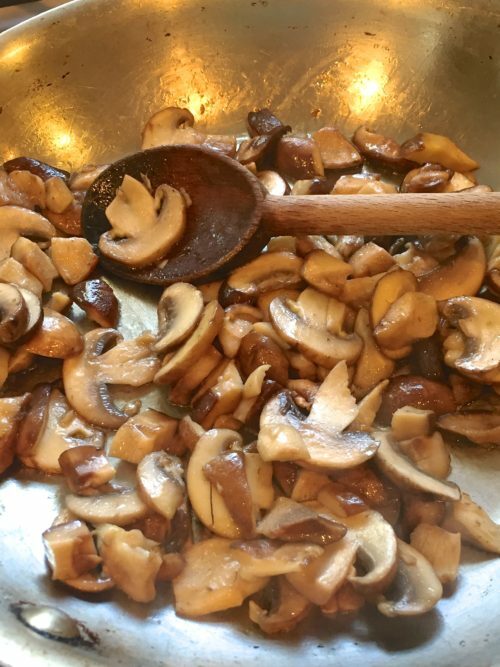 Saute the mushrooms in 1 tablespoon of oil and 1 tablespoon of butter until golden brown. Remove from pan. 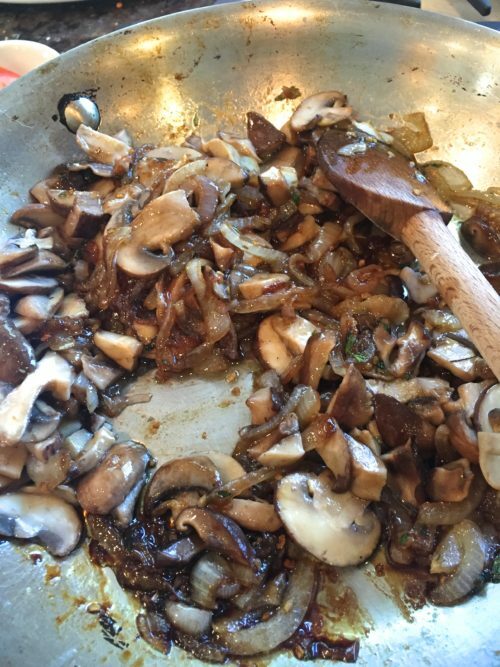 After you caramelize the onions you will add the cooked mushrooms. After you have combined the mushrooms and onions, cool to room temperature. 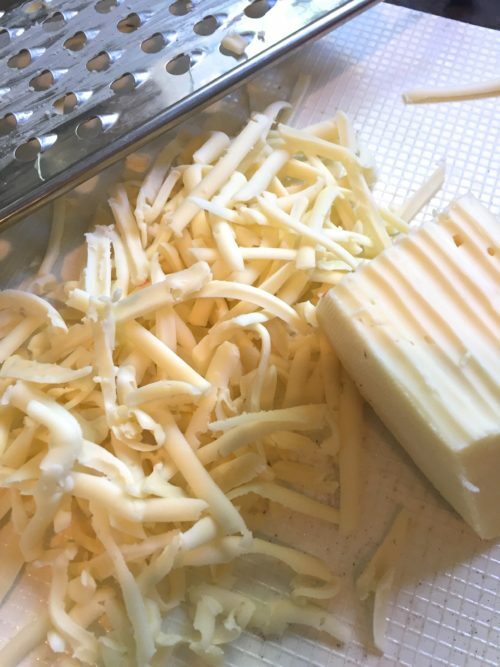 Grate the fontina or Swiss cheese and add this to the cooled mushroom/onion mixture. 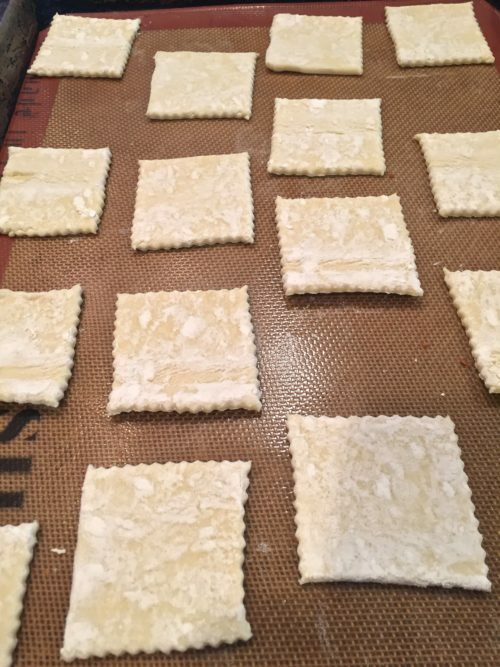 Cut puffed pastry into 2 1/4″ squares. Put one tablespoon of mixture on each square. Don’t worry that you have too much (I didn’t use enough) because the puff pastry will rise up around it. Enjoy Warm out of the oven. In a large skillet over medium heat, heat 1 tablespoon of olive oil along with 1 tablespoon of butter. Add the mushrooms and saute for about 5 minutes until tender and they start to brown. Remove from pan and set aside. Heat the remaining 3 tablespoons of butter along with the 1 tablespoon of olive oil and saute the onions for about 5 minutes; add the dried thyme and sugar and continue cooking for about 20-25 minutes until they have caramelized. 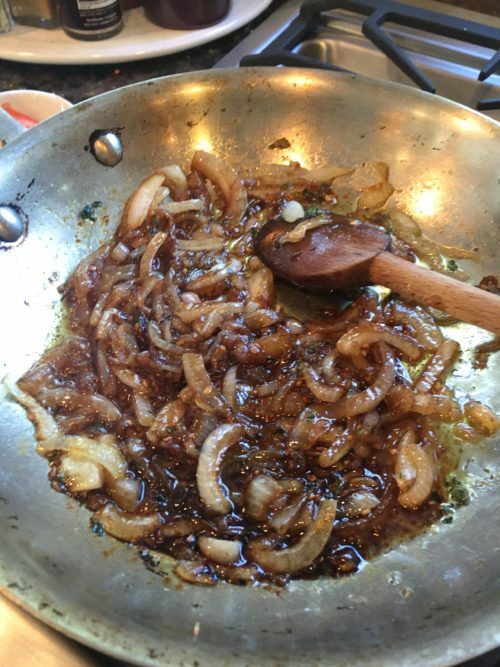 Add the balsamic vinegar to deglaze the pan, allow the onions to soak in the vinegar. Turn off the heat. Add the onions to the mushroom mixture. Season with the garlic power and salt and pepper to taste, stir. Cool to room temperature or can be refrigerated at this point. 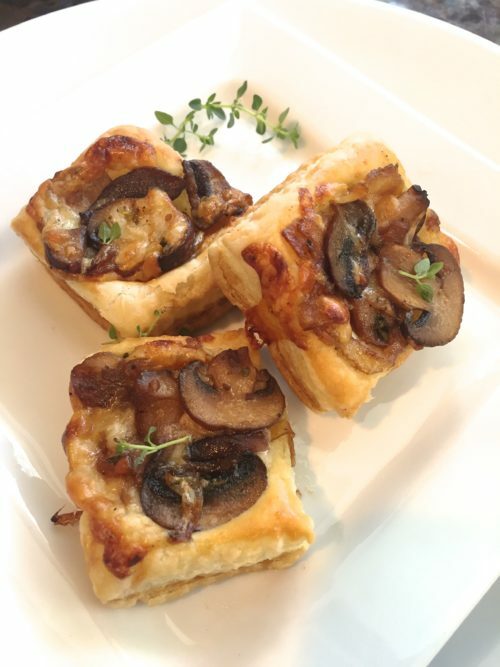 If you refrigerated the mushroom mixture, let it come to room temperature before putting together the tarts. Add the cheese and mix well. Heat oven to 400¸° and position two racks in the upper and lower thirds of the oven. Line two baking sheets with silicone mats or parchment paper. Use a knife or pizza cutter and cut the puffed pastry into 2 1/4" (comes out exact) squares and place them on the lined baking sheet. 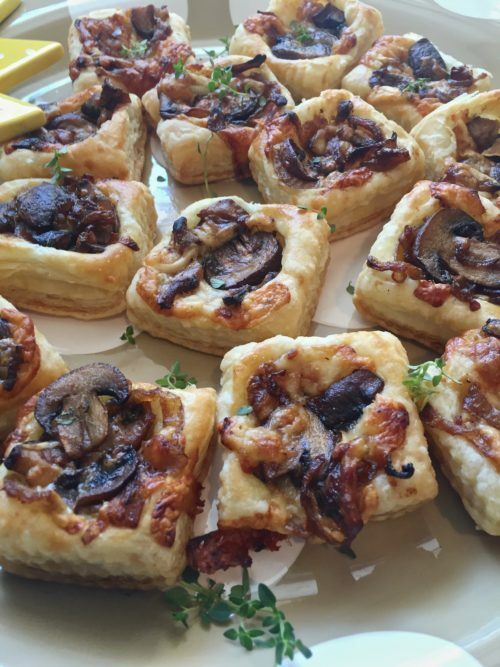 Make sure the puff pastry is cold before adding the topping. If it isn't allow to sit in the refrigerator for 10-15 minutes. Use a pastry brush and brush the beaten egg on the squares. 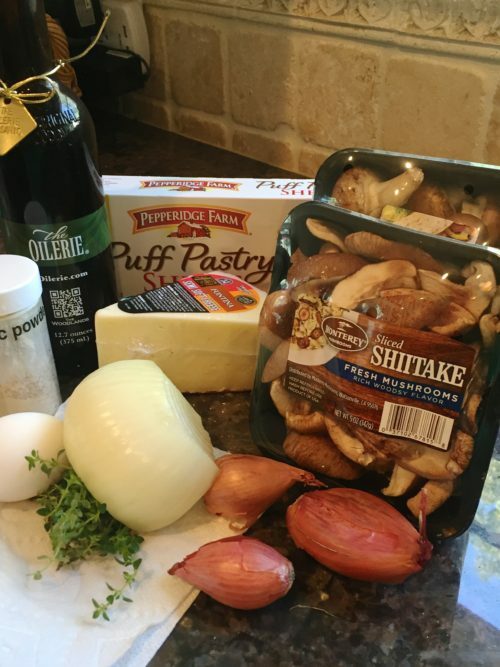 Place a tablespoon of the onion/mushroom mixture in the center. Bake for 20-25 minutes, rotating the pan halfway between until crisp and golden brown. Let cool slightly before serving. Little Spice jar used a applewood smoked gruyere -- I'll try that the next time. A few other things I would do differently the next time -- one I might try a white balsamic because my mixture turned dark from the vinegar and also I would use all white or yellow onions; I had some shallots so decided to use some of them and they could have turned dark purple and made my mixture darker than the original recipe. Also I would put more topping on each square -- maybe 1 1/2 tablespoons.